The life and death of Socrates! The one voice that stood out all through the centuries! 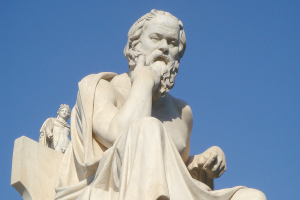 What makes Socrates’ life and death? Some reflections on a recent trip to Greece and the historic sites! You see, that since my travels in Greece recently, I have come back and not yet recovered! I am dumbstruck! Not recovered from my many questions about what I saw and what I comprehended from what I saw and to what I have read before. When I visited the most ancient site, namely, the Mycenae site, the 2,000-1,500 BC stone fort, the home of the legendary king, Agamemnon, where I saw the nearby new archeological museum where the original mud signs, the ancient scripts are displayed, I thought I need to study more about the ancient Greek history. As soon as this thought crossed my mind, we ordered some more books on the Amazon in our kindle. That is one of such books, now I find they are all authoritative, one book, “The coming of the Greeks, Indo-European Conquests in the Aegean and the Near East by Robert Drews came into my hands. Now, I find that the Indo-European languages family claims the Greek language too. Also, I was surprised that the book quotes from the 1786 Sir William Jones’s claim that among the Indo-European languages come not just Greek but also Sanskrit and other Celtic and Germanic languages; they had so many similarities and that “they must have had a common linguistic ancestor (page 4). So, one thought led to others and thus I am stuck still in my own rudimentary knowledge of things! We in India are very much conditioned by what the British gave us by way of the outside world colonialism. More so when we realised that, thanks to the Macaulay education too; we are conditioned by the narrow view of the world outside. In the Indian scheme of the world, never once we thought of the impact of the Greek and Roman civilizations on the rise of modern awakening. Not even the so-called Bengal Renaissance went beyond the British conception for Indian education. It was very narrow conception, isn’t it so? So, our old, the first, educated classes, we can trace them from Raja Ram Mohan Roy’s time, anything beyond this Macaulay prescription. Before that time all we had had is what the Mughal rule gave us. When we come near our own times, even Mahatma Gandhi and Pandit Nehru didn’t go beyond the Hind Swaraj and the Discovery of India! Never once in the Indian education history and tradition, the rise and coming of the Indo-European languages spread and then the rise of the classical Greek, later, the Roman contribution, the Latin language and cultures penetrated the Indian soil. So, my mind is still digesting what I saw in Greece today and what I read about the classical past there. I had almost fallen silent. I am not able to find the energy to talk to people, friends and acquaintances, why even to people whom I consider to be serious and scholarly. Why this mental block, if we call so? For the unexplained reasons like the total uninterest, unconcerns for subjects like distant lands and distant histories. We have historians, some I know and some I respect for what they have done by way of their historical studies. 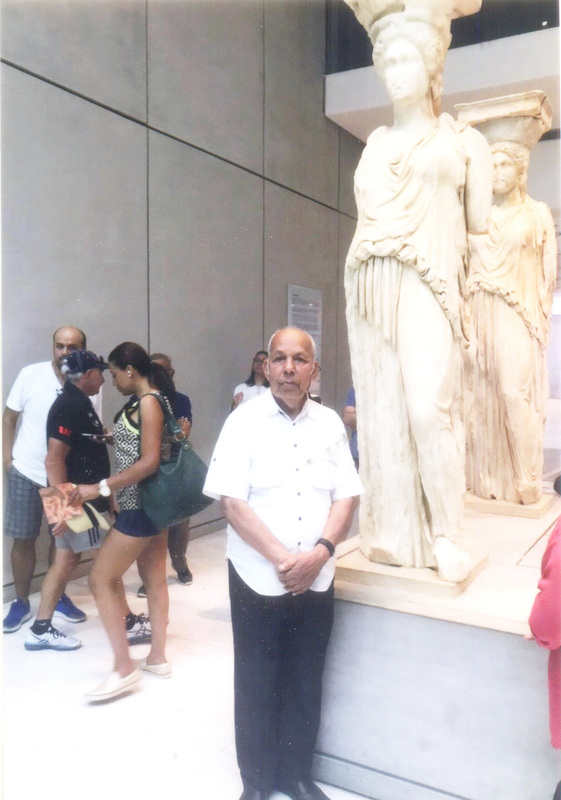 But after such a visit like the one I had to Greece, even before some years to Rome, I don’t find many in India who are excited as I of course do, rather unjustifiably, I don’t know. Anyway, it looks I might take longer time than I envisaged before I can unravel my mind or the forces that work at cross purposes for coming out with a sense of coherence to my present state of mind. One thing that struck me as if it was lightening of sorts is the utter unbelievable sights and findings at the historic sites like the classical Greek’s 2,000 BC Mycenae in the Eastern Peloponnese territory of Greece. First I must ask my readers to have looked at the atlas of the Greek island nation. It is very unusual. You hang your palm downwards to the earth and see how the fingers are spread out. Likewise, the Greek mainland from Balkan countries spreads out into the Mediterranean sea and there are some 2,000 islands that encircles the Greek mainland and the Asia Minor lies on the eastern side and the Egypt lies down below and Israel and Jerusalem starts and goes up as far as Italy in the West and in the east lies Rutkey who saw eastern parts were once part of the Greek colonies and it is long history we are talking about here! From the legendary, why even mythological Trojan War and Troy city and the legends associated with Homer’s classics, the king Agamemnon to Helen and Pritam and other characters. This is a period from 2000 BC to 500 BC when the classical Greece emerges, when Socrates, Plato and Aristotle come to life. 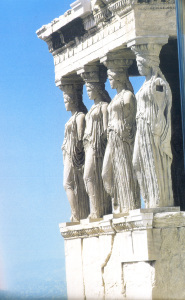 Greek history is long and very complex and the characters we are interested and the world is fascinated by a multiple of great minds and achievements. Poets, philosophers, artists, great builders and great sculptors and a variety of others like the four great classical great dramatists and scientists and philosophers, so many philosophical schools that flourished and once Athens was the world’s great cultural center where the ancient world, the Romans to later generations flocked to know and learn from these philosophical schools. And the greatest attraction of the modern day tourists is the incomparable historic buildings, the world’s many wonders like the Athens’s Acropolis that stands out in the midst of the modern Athens city. The series of other wonders, from the Delhi Oracle site and the Epidaurus Theater and the many other structure, each one unbeatable in their majesty and awestruck construction! Many are of course in ruins today and yet the remaining ones in themselves would shake us from our any preconceptions. The Greek man and woman, seen in their sculptures, in the refined dress and gestures give us a new conception of man and his character. The new fields in which they contributed to man’s history needs over one’s entire life time to be told. I had been reading about Greece since my Oxford days. All these years what I read in printed books and pictures gave me of course great delight and fulfillment. Yet, after I actually went to Greece and spent time there and as I mixed with the people today and saw their past in the museums and galleries and travelled through the Greek countryside I was exhilarated by the actual personal interaction, talks and discussions and the total impact such human interaction that gave me. But once I came back and took my collections of books back and when I scanned through the pages I get a very different sort of feeling. The once printed pages now came alive and awakened inside me a very different sort of feeling and my intellect was stirred. I ask, or, I feel like asking certain new questions. I don’t know whether I am qualified to ask such questions. But to whom else I can leave such questions. That was the dilemma. There are old books, Plato’s Republic and his other volumes from Symposium to other books that all deal with Socrates’s last days. When I now read them I feel like shedding tears. I walked on the very soil where the great soul, the very personality of Socrates walked and stood and questioned the youngsters he met there. All these moments acted inside me and changed me to fall into a sort of delirium! Why there was only one such person like Socrates in the world? Why we don’t see such men in later times? Why only one Plato? Not one more Aristotle? These were one line of thinking I had. Another line of my thought was: from where do the Greeks come here, to the Greek mainland? Also, when did the Greek language developed into such maturity, such classical purity? Now, the rise of sciences and philosophies! Here too the Greeks inherited many ideas from the near East, namely, in what is called the Asia Minor. How Socrates lived and how he spent his days, how he served in the wars and also did his duty as a citizen etc. are all set out in the many dialogues written by Plato and to this days they have been studied and opinions crystalized and so too others of Socrates contemporaries whose ‘memories’ are all with us. In the course of life one reads Socrates and draws lessons for oneself. Socrates was the most famous man of his time in Athens, he didn’t want to assume any political leadership, and he only offered intellectual leadership. The Athens of his day was, like ours, a place with full of strife and controversies and so he was condemned to death for his “impiety”, he embraced death as inevitable outcome of principled political endeavor. Of course, we are ordinary souls, not what Socrates believed in the immortality of the soul. Even now, if we give a close reading of his last days, we feel like crying. So, moving and so sad his last moments. For me at any rate, a pilgrimage to his beloved Athens and to the very spot in the ancient Agora where his steps are traced and preserved all through the last 2,500 years is a real pilgrimage and a salvation of sorts. We would cherish his earthly surroundings and Plato’s dialogues would continue to inspire future generations of mankind. (Based on somewhat hasty reading of “The Last Days of Socrates”(Penguin)).